With the acceleration of inflation, the Banco Central de Venezuela (BCV) became an unreliable source of inflation data. Indeed, in December 2014, the BCV stopped reporting inflation statistics on a regular basis. 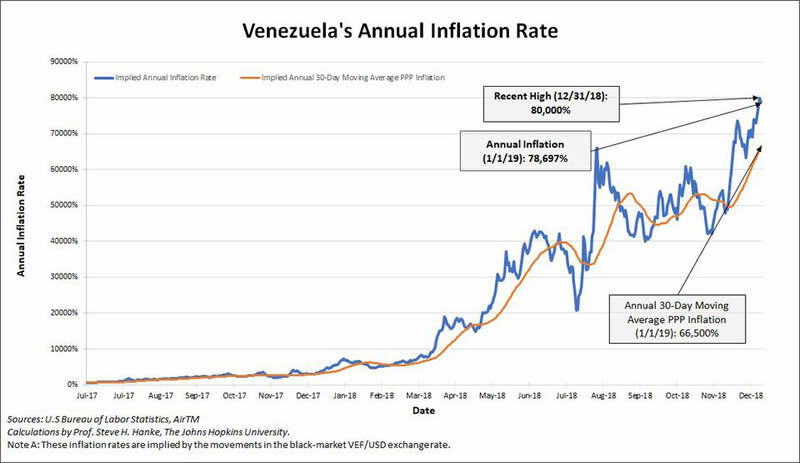 To remedy this problem, the Johns Hopkins-Cato Institute Troubled Currencies Project, which I direct, began to measure Venezuela’s inflation back to 2013. So, how do we accurately measure Venezuela’s inflation? There is only one reliable way. The most important price in an economy is the exchange rate between the local currency - in this case, the bolivar - and the world’s reserve currency, the U.S. dollar. As long as there is an active black market (read: free market) for currency and the data are available, changes in the black-market exchange rate can be reliably transformed into accurate measurements of countrywide inflation rates. The economic principle of purchasing power parity (PPP) allows for this transformation. And the application of PPP to measure elevated inflation rates is rather simple. The hyperinflation episode ends when the monthly inflation rate falls below 50%/mo. mark, unless the monthly inflation should exceed 50% per month for another 30-day period within a year after the first episode is terminated. In this case, the second episode is not counted as a new hyperinflation episode, and but is instead considered a continuation of the original episode. In Venezuela, the monthly inflation rate exceeded 50%/mo back on November 13, 2016 and remained above 50%/mo until December 14, 2016 (32 consecutive days). On December 15, 2016, the monthly inflation rate fell below 50%/mo mark. Then, on November 3, 2017, the monthly inflation rate again exceeded 50%/mo threshold, before falling below the threshold on December 17, 2017 (for 44 consecutive days). So, Venezuela has been engulfed in a hyperinflation episode ever since November 13, 2016, with another flare up of the same episode occurring during the November-December 2017 period. Venezuela is the only country in the world that is currently experiencing the ravages of hyperinflation. As 2018 came to a close, Venezuela’s hyperinflation, which I am able to accurately measure by applying Purchasing Power Parity (PPP) to high frequency, reached 80,000%/yr, and has lasted 25 months. Devastating as it is, 80,000% is a far cry from the International Monetary Fund’s unbelievable end-of-the-year inflation forecast for Venezuela of 2,500,000%/yr. One should never forget that one can measure episodes of hyperinflation with great precision, but no one can reliability forecast their durations or magnitudes—a fact that has failed to penetrate the walls of the IMF’s insular bureaucracy. How can Venezuela pull itself out of its economic death spiral? Venezuela must officially dump the bolivar and adopt the greenback. Official “dollarization” is a proven elixir. I know because I operated as a State Counselor in Montenegro when it dumped the worthless Yugoslav dinar in 1999 and replaced it with the Deutsche mark. I also took part in the successful dollarization of Ecuador in 2001, when I was operating as an adviser to the Minister of Economy and Finance. Just what does the Venezuelan public think of the dollarization idea? To answer that question, a professional survey of public opinion on the topic was conducted in March 2017 by Datincorp in Caracas. The results are encouraging: Sixty-two (62%) of the public favored dollarization. Since things have considerably deteriorated since that survey, my conjecture is that the proportion of Venezuelans favoring dollarization has substantially increased. It’s time for enlightened, practical politicians in Venezuela to embrace the dollarization idea. The fact of the matter is that the public has already spontaneously dollarized the economy.